Chain maille is a long-standing tradition in the jewelry world. If you want to try out this time-tested jewelry making technique, there is no better way than with a pair of DIY earrings. This collection, Chainmaille Jewelry Projects: 12 DIY Earrings, contains a plethora of fabulous chainmaille earring projects that you are sure to adore. Chainmaille designs were once used for armor, but nowadays, you'll be using these chain maille patterns as a fashion warrior for beautiful jewelry accessories. From Europe to Asia, the roots of chainmaille jewelry go back far in history. Now that these woven strands of jump rings are being used more and more in DIY jewelry, new patterns and designs are emerging. From box chain to barrel weave, we've you covered with a bunch of different chainmaille designs to help you find the right homemade earring design for you. With these fabulous tutorials, you will learn how to make earrings in variety of different ways using chainmaille. These stunning jump ring patterns can look a little tricky at first; but, don't be intimidated. Once you get to hang of opening and closing jump rings, you will quickly become a chainmaille addict. You are sure to impress with these stylish and stunning DIY jewelry designs. Prepare a few pairs of pliersm, stock up on your jump rings, and check out these cool chainmaille earring tutorials and start making these intricate patterns today. If you love these chainmaille earring patterns, be sure to check out our awesome collection of 39 Free Chain Maille Jewelry Patterns! Think chainmaille patterns are all gleaming golds and sparkling silver designs? Think again! Chainmaille jewelry can come in a variety of colors, and dazzling DIY earrings are no exception. From pretty purples to precious pinks, experiment with your favorite hues and make the right colored chainmaille earrings project for you. Beads make everything better! Decorate your chainmaille earrings with pretty beads. These pretty DIY earrings patterns are perfect for gift giving because you can customize each pair of homemade earrings with different colors and beads. Jazz up your chainmaille earrings today with these beautiful DIY beaded earrings. 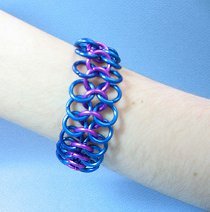 Haven't found the chainmaille pattern you are looking for yet? Don't fret, we have more chainmaille designs for you. If you are looking for learn new ways for how to make earrings, at least one of these DIY earring designs is sure to fit your fancy. Want to see the latest chainmaille earring patterns? Be sure to check our Chainmaille tag page!